To set the leg servos, transfer the "ServoCenter" programme (located in the "Locomotion" directory) to the Hexapod Robot Board. The programme automatically moves the servos from "S0" to "S17" to the middle position. Connect the servos to the pin headers as shown in the figure (pay attention to the polarity!). 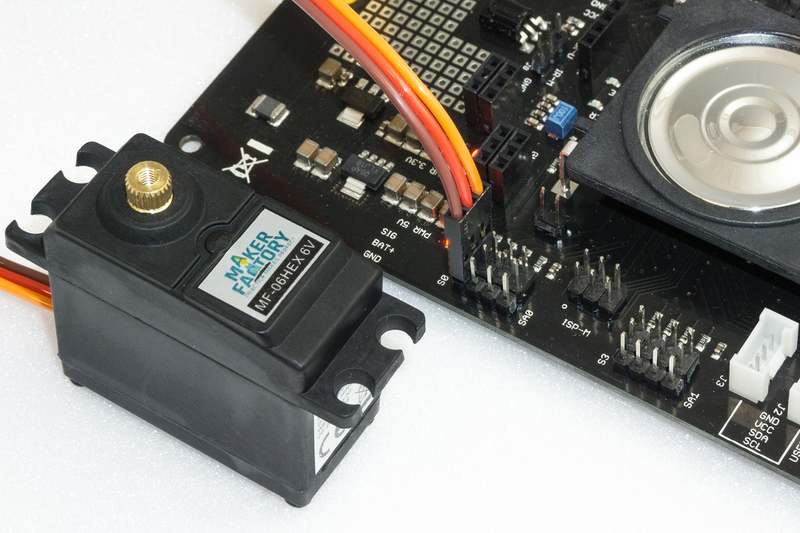 All servo connections (S0 to S17) of the robot board are controlled with a pulse width of 1500 μs. At this point you do not have to connect all 18 servos to the Hexapod Robot Board at the same time. In practice, it has proven to be much easier and faster to use only one connection (e.g., S0) and then move one servo after the other to the middle position. The brown wire of the servo cable points to the edge of the board. The board is also labelled SIG (pulse), BAT+ (+), GND (-). → The battery must be connected for this procedure! Figure 17 shows the pin headers to which the servos are connected. → The pin strips labelled SA0 to SA5 do not carry a control signal. This connection remains unassigned and can later be used for proper extensions such as leg contact sensors. Servos have electronics, a motor and a potentiometer. The potentiometer picks up the mechanical position of the servo and forwards it to the servo electronics. The electronics in the servo compares the given position (nominal value, in our case the pulse width given by the locomotion controller) with the pulse width of the servo electronics (set via the potentiometer, actual value). 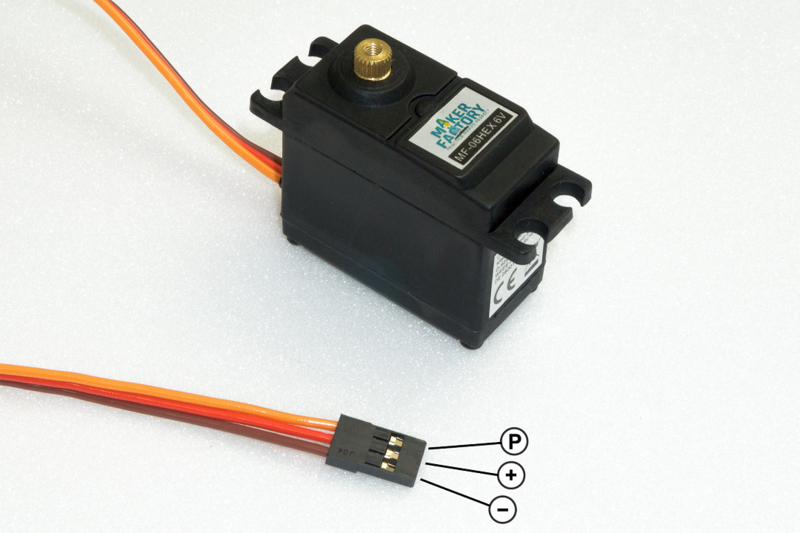 If there is a difference between the two pulse widths, the servo electronics regulates the motor to the target position. 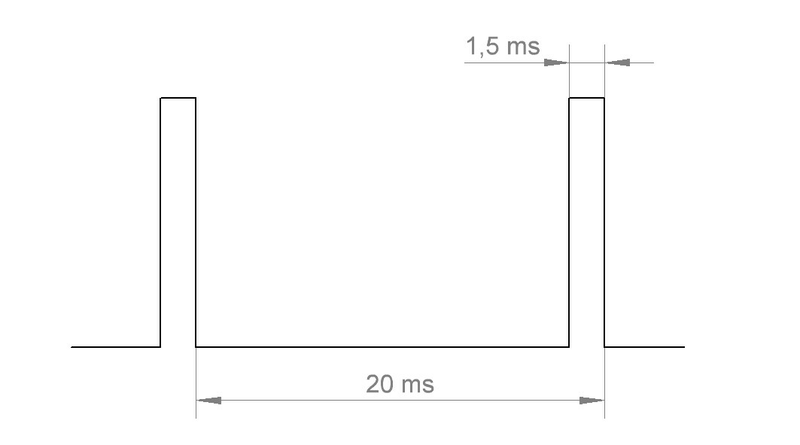 The graphic illustrates the pulse/pause ratio required to control a servo. In this case, the pulse has a length of 1.5 ms = 1500 μs, which corresponds to the centre position of the servo. A servo receives as control signal a positive pulse with a pulse width between 500 μs (0.5 ms) and 2500 μs (2.5 ms). The total period duration of the control signal is 20 ms. When the servo is in the middle position, the pulse width is 1500 μs (1.5 ms). If the pulse width is less than 1.5 ms, the servo rotates in one direction. If the pulse width is greater than 1.5 ms, it rotates in the other direction. The angle of rotation is proportional to the pulse width, i.e. the longer or shorter the pulse, the more or less the servo rotates in the corresponding direction.